Pavel Yakovlev makes ‘great scientific discovery’ near his village in Yakutia. The fifth grade student discovered the ‘jewellery’ decorated with ancient Turkic runic inscriptions. The four words are believed to be in the Orkhon-Yenisei type script. Such writings are normally found in rock art in Yakutia, also known as Sakha Republic, the world’s coldest region and the largest within the Russian Federation. Academic Ninel Malysheva said: ‘Runes rarely occur on such things as talismans and amulets. ‘If it is confirmed that this bone found in Namsky district is genuine, it will be a great scientific discovery for the republic. Studies on exact dating and decoding the inscription are underway at the Museum of Writing, part of the North-Eastern Federal University (NEFU). One theory is that the words express ‘good wishes’, but scientists hope to find the exact meaning. Pavel’s village is some 100 kilometres north of Yakutsk, the regional capital, and the world’s coldest city. Another example of Turkic runes in Yaktutia is the so-called Petrov inscription. It is a writing made using ocher some 200 km from Yakutsk. It is known as the most northerly rune inscription in the world. Researchers in the middle of the last century believed that the inscription indicated the location of medieval treasure. A literal translation is said to read: ‘Pearls of the tribe Az.’ Such Turkic scripts date back 1,000 years or more. The Old Turkic script – also known as variously Göktürk script, Orkhon script, Orkhon-Yenisei script – is the alphabet used by the Göktürks and other early Turkic khanates during the 8th to 10th centuries. The script is named after the Orkhon Valley in Mongolia where early 8th century inscriptions were discovered in an 1889 expedition by Nikolai Yadrintsev. These Orkhon inscriptions were published by Vasily Radlov and deciphered by the Danish philologist Vilhelm Thomsen in 1893. This writing system was later used within the Uyghur Khaganate. Additionally, a Siberian variant is known from 9th century Yenisei Kirghiz inscriptions, and it has likely cousins in the Talas Valley of Turkestan and the Old Hungarian alphabet of the 10th century. Words were usually written from right to left. Yakut runic letters are the least studied in Siberia. They provoke heated discussions among the linguists and Turkologists. But most new finds of inscriptions are made in Yakutia. Now the total number all Yakutian finds is close to 90. 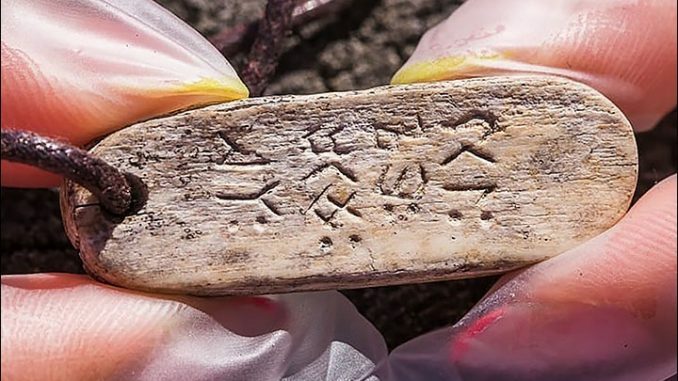 Most runic inscriptions of Yakutia have not yet been deciphered.